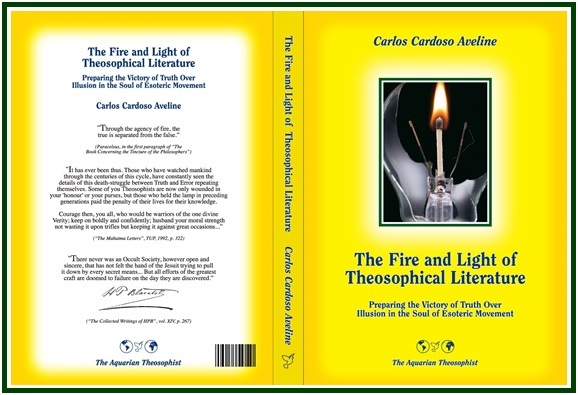 The Aquarian Theosophist, Portugal, 255 pp., 2013. In the last paragraph of “The Key to Theosophy”, HPB sees a direct relationship between the state of the theosophical movement and the state of human karma and civilization. The movement is for her a causal factor; the state of the civilization belongs to the world of effects. The importance of HPB’s statement is great. It reveals the magnetic nature of the link between the theosophical movement and mankind. The movement is a collective “body” possessing active seeds of buddhi-manasic activity. Mankind is the soil or the object of agricultural activity. If the right seeds are correctly planted, the crop will be available in due time. HPB’s sentence describes the nature of the occult responsibility of the movement, with regard to mankind. It is occult, yet it is real. It is unavoidable, for it is part of human evolution. It is in the very essence of the movement, in its astral light substance, in its aura. That helping mankind is the duty of the movement is stated in numerous passages in the “Mahatma Letters” and in “Letters from the Masters of the Wisdom”. It is recorded in the first object of the movement, which is “to create a nucleus of universal brotherhood”. Individuals can always deny - in deeds, more than in words - that this is the purpose of the movement. Many behave as if this goal were but a propaganda slogan. Yet the movement itself can only live by being faithful to its own magnetic nature, made of universal wisdom and ethics. If at any time the movement has less vitality than expected, all one has to do, in order to identify the problem, is to examine the amount of altruistic motivation in its members. In such an examination, the observer should start by verifying his own degree of altruism. In the fulfillment of its long-term task, the movement needs individuals who take practical steps to expand their own Antahkaranas, thus widening contact with their higher selves. This requires self-discipline. The arithmetic number of such individuals is of secondary importance. In the right time, these comparatively Few will be able to stimulate and help ignite the fire of inner life in many others. The collective awakening will spread throughout mankind in a rhythm dictated by Karma. This has started to gather momentum from 1875, but its results are not necessarily visible yet. It is the duty of these students of theosophy, and also a source of happiness for them, to TRY and activate the potentiality by which growing sections of the theosophical movement will go beyond attachment to routine  and will help produce more elements of information and stimuli for thousands and millions of people worldwide to expand contact with their own immortal souls or higher selves. This must gradually open room for the next and sixth type of present human psyche, which in the terms of “The Secret Doctrine” is called “sixth sub-race of fifth root-race”. The sixth human type or “sub-race” of present root-race will be ready to live universal brotherhood in a conscious and practical way. Its gradual appearance will make humanity see brotherhood as a fact, thus abandoning the now common practice of fratricide. The theosophical movement was created to help prepare that. The dharma and duty of theosophists is not to try to prevent geological changes through social activism. It is true that the effects of geological changes will be less dramatic if planetary consciousness expands, and this is a noble goal. But geological events are part and parcel of human and planetary evolution, and they are necessary to it. The theosophical duty is to make an effort to understand the present challenges from the point of view of esoteric philosophy, and to share the theosophical view of the planet so as to help mankind’s spiritual and ethical awakening. The planet is septenary, and its various levels of consciousness are all interconnected. In the 21st century, a multidimensional transition is taking place. Old forms of theosophical action get dysfunctional. New forms are still in their beginnings. The inner crumbling of old forms of theosophical work expands in parallel to the outer crisis of a materialistic civilization; and these two facts take place together with the acceleration of geological events in every country and continent. * Is there a causal relationship between the process of sustaining and activating the movement along its Original Lines and the necessary self-renewal of present civilization? * How best can each of us, and all of us, TRY to be gradually more helpful in this unified and permanent process of creation, preservation and renewal, which occurs in the long term and mainly at the invisible or causal level? See for instance “The Great Master’s Letter”, also known as “View of the Chohan on the T.S.” and as “The Maha-Chohan Letter”. Mental dispersion and the search for “novelties” are forms of routine.